Dynamic polymorphism which is evaluated at run time not at compile time so we are sure that errors are not known before execution. Like e.g Explicit casting is evaluated at run time. //You cant cast test to a Department! Above code is about handling exception but how about doing some more logical coding in the failed case, coding into catch not good example. We can determine whether the given type is compatible with another using ‘as’. Compatibility check will return null value. Unlike as keyword is keyword returns false if compatibility between objects or casting failed. Here we are checking runtime what incoming base class reference is actually pointing in memory. So we are not using try catch as well here to wrap the casting. What is upcoming in microsoft? What is latest in Microsoft Winodws Azure -HDInsight? So now you must have understood that to work with HDInsight you need Winodws azure storage account and pay for it so that you get maximum feature use. How does view state data value assigned to controls on Html form or How user inputs value retained after post back. This is all above comes in PageLifeCycle and we can find many articles on that. I have small understanding on very important thing and I would like share.. When Post Back happens or any server side event fired their are major event which plays role to retain data of view state. LoadPostBackData – This function is only applicable for Postback. When the page is given to asp.net engine with all markup asp.net engine calls for several functions to complete the server side load. Browser on event firing or postback will pass on the values to ASP.NET engine using HTTP POST header which actually has _VIEWSTATE. IPostBackDataHandler interface will take care of calling LoadPostdata function for all the server controls for which loading view state is applicable.All listed controls in IPostBackDataHandler will have call for LoadPostdata () method like textbox, listbox. So here we can see that its not viewstate which is only responsible for loading user input to controls. Page Load – In this event the load view state happens along with post back data. Save View State -In this stage Page class construct View State for page which has to be maintained across post back. It is called according to the hierarchy defined in Page Instantiation for all the controls(stored in the WINDOWS\Microsoft.NET\Framework\version\Temporary ASP.NET Files). In .net the object plays role everywhere even if you directly code or do not object has its existence. I have small program which was Interview Question at Microsoft. C# code and understand the life of object. So the object of class log which has only one variable in it and methods which has argument passed as its own object is having different scope in different assignment. In Main Method object is initialized with values first time so first writeline statement gives 10. Second method call TestA with object o is passed. Inside the method their is just reassign of value to int as 100 so the value 10 is replaced to 100 for object o which is still having same reference. Third method call TestB in which again object o is passed which had value of int as 100. Now inside method new object initialization happens that means new object o for which int value is 1000. Now you must be wondering third value is not 1000, this is because TestB created new object with new memory allocation. So test object scope finished ones it came out of the method. Since the Writeline method is calling value available in object o it has given 100. In above case what is happening is we are copying return value of int from TestB method and assign it to object o.i int value. of course TestB return type has to be changed from void to int. Hmm. . Starting late when Microsoft has already come up with most of the latest versions on their own Cloud that is Windows Azure. Today I got time to go through some of the videos available in MSDN and came to know how cloud works in Windows Azure providing extensions to all available application templates which are heavily used like ASP.NET, Windows Forms, MVC, WCF, SQL. Watching videos gives feeling that Cloud or Windows Azure is simple and I can straight away go ahead create my application in Azure but I am beginner in this so hurdles are sure in starting. Problem: I could not get Windows Azure SDK installed on VS 2010 ultimate version. Reason: Error specified that I had nugets of MVC3 updates installed which are not compatible. It means still some more opportunities to Microsoft for giving fix or Patch. It is true that I installed MVC4 not MVC3 but it had latest updates which I installed from Nugets option available in VSTF Extension Manager under tools. Why this issue? I am not sure. Create new application under Cloud same way you create without using cloud. Publish it using options available in properties. 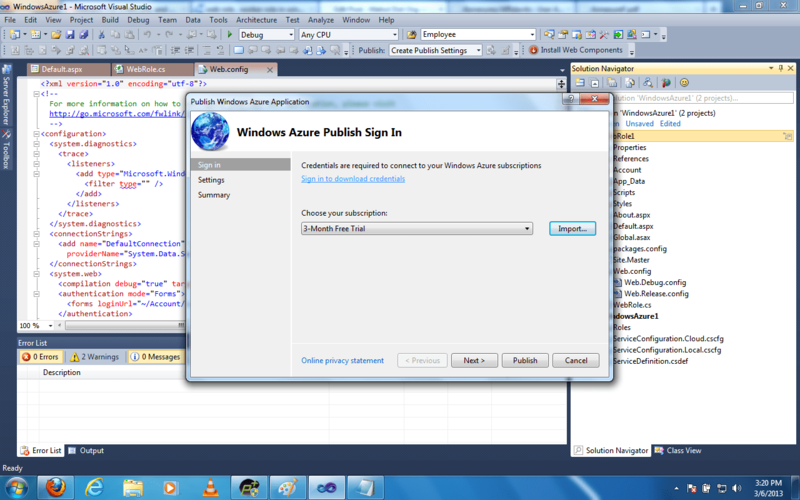 Host it in Windows Azure using your lab account if you do not have it create Trial one. 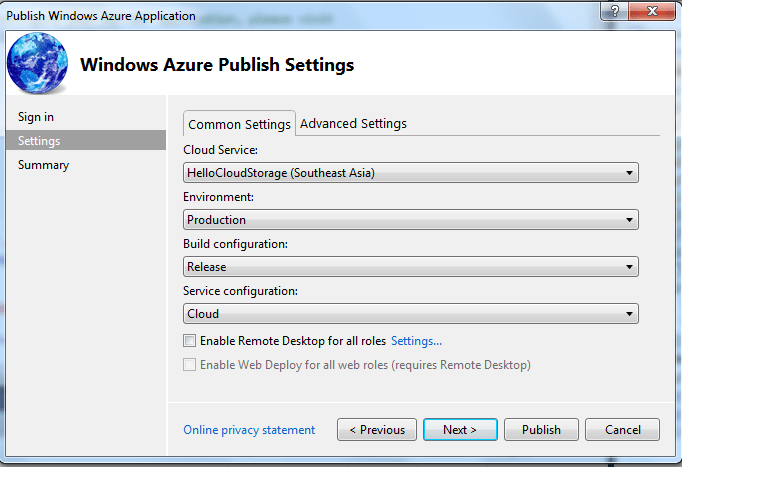 Deploy it on Windows Azure region. If I am not wrong Cloud concept is available from the time Domain has come into picture. Some one is providing domain as well as host server environment and user is just publishing deploying the package. But Cloud is more advanced gives you more features which are important for Development team like Building, Configuration, Different Data Source management, Versioning many more. Now above all steps are possible if you are already familiar with .NET. So here is the solution I followed. 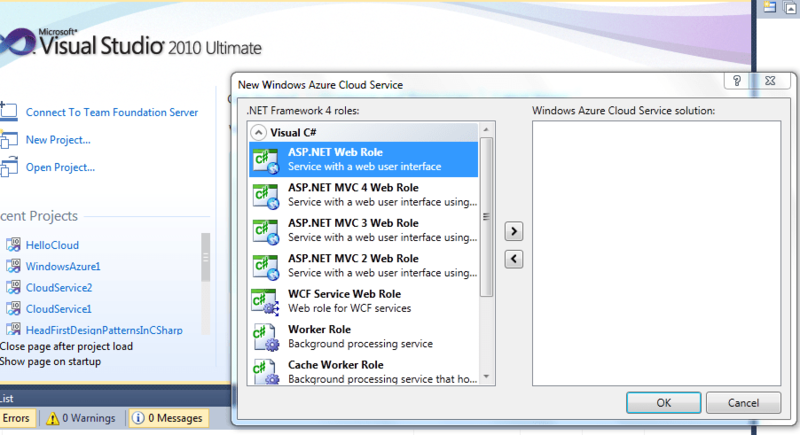 I read FAQ and googled it but could not get the working solution where I can keep MVC4 and then Install Windows Azure. If anyone reading this article and found right solution please do comment. 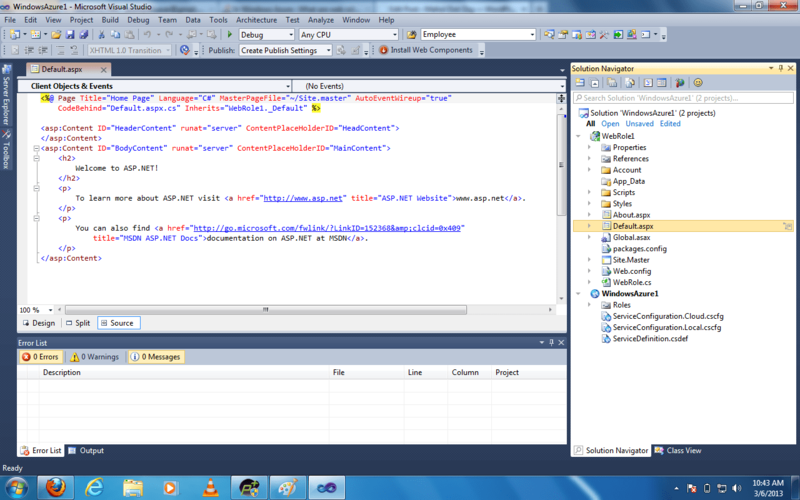 Solution: I uninstalled MVC4 not from nugets but from Control Panel and then Installed Windows Azure SDK. It worked. I received above error when I tried to include my ASP.NET application into IIS 7 and browse it. This because of the handlers missing for specific version of Microsoft Dotnet Framework in your IIS 7. I had installed visual studio 10.0 and later I installed IIS 7 So IIS did not pick up all the handlers required for running application built in ASP.NET 4.0 or .NET 3.5 framework. Every time I browse any page of the application from IIS it shows only error with index 500.21, 500.19 .. Step 2: Ones you see list of all features in the popup check for Internet Information Services features and should have check-box enabled for ASP.NET. Note: Make sure you opened the command prompt using ‘Run as Administrator’. 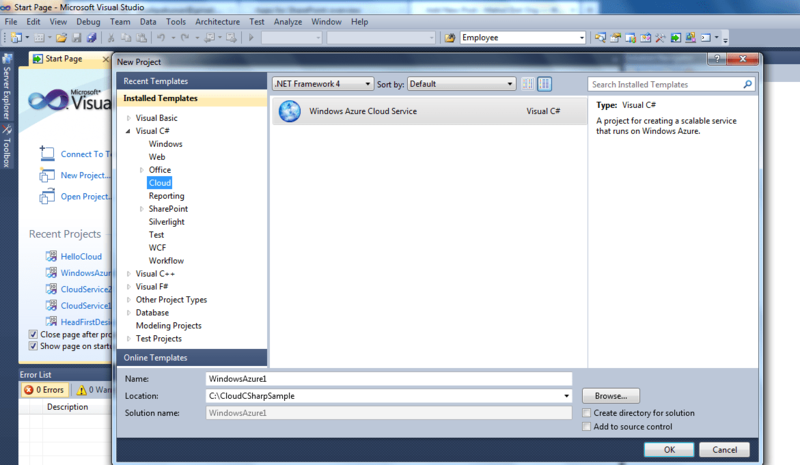 While doing above operation you should close all instances of Visual Studio IDE, tools. This will add all handlers in IIS 7 and try browsing the page you should get the page without error. You should also check that your application pool is targeted to use appropriate framework version.